The Glengate Hotel, in the heart of Niagara Falls, makes a commitment to ensure your 100% satisfaction guaranteed. Whether you are a business traveler or simply here on vacation, your satisfaction is the number one priority of the staff at the Glengate Hotel. The Glengate Hotel has a large selection of family and honeymoon suites. From a spacious two-bedded room unit to the huge family suite, and the honeymoon suites, the Glengate has your diverse needs in mind. From a spacious two-bed room unit to the beautiful honeymoon suites, the Glengate Hotel is a great choice for accommodations in Niagara Falls, Ontario for any type of traveler. When you stay at the Glengate hotel, you are offered a complimentary continental breakfast and free underground private parking. The Glengate Hotel, in the heart of Niagara Falls, makes a commitment to ensure your 100% satisfaction guaranteed. 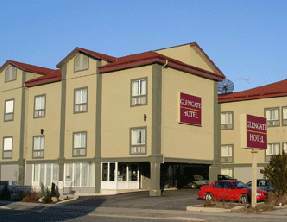 This hotel is conveniently located close to the major highways in Niagara Falls and only minutes from Clifton Hill and the Falls. This Niagara Falls Hotel does not have its own on-site restaurant, but there are many local dining sites to choose from, all of which are located nearby.